Ms. Turner was the chairperson of the International Feature Film Competition Jury, which awarded the Gold Hugo – the top prize – to “The President,” from Iranian director Moheen Makhmalbaf. The actress was also honored with a showcase on October 14th, “An Evening with Kathleen Turner.” Before that event, HollywoodChicago.com got to ask her a couple questions on the Red Carpet, and photographer Joe Arce captured this Exclusive Portrait. HollywoodChicago.com: Film actress Lauren Bacall just passed away, and you were always favorably compared to her, what memories do you have about your encounters with her? 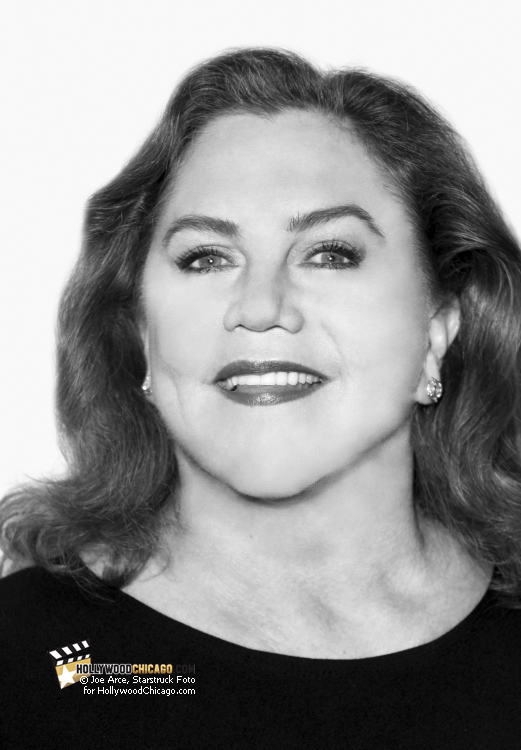 Kathleen Turner: Lauren Bacall and I used to have a great game. Whenever we met each other at a restaurant or an event, she would always greet me with ‘Ms. Turner,’ and I would reply, ‘Ms. Bacall.’ That exchange would gravitate downward as our voices got lower and lower. (Deepens voice] ‘How are you?’ ‘Nice to see you.’ How low could we go? It was great fun. HollywoodChicago.com: Your brand of sexuality on film was very unique, and almost freeing. Why don’t you think actresses today can access that part of themselves as readily, is it today’s restrictions or how the business had changed? Turner: We certainly broke ground with ‘Body Heat.’ I think it depends on the level of filmmaking. If you’re talking about the studio, I think it’s all rather predictable. But as we stand here, we have a thriving festival growth and risk in independent films. It has picked up strength over the last 15 years, across the country and across the world. It’s very exciting, and I’m happy to be a part of it here. HollywoodChicago.com: What film of yours do you believe culturally will still have resonance in the future? Turner: I would hope that would be ‘War of the Roses.’ But I also think ‘Body Heat’ and ‘Prizzi’s Honor’ will last. I think I’ve made some pretty good choices, don’t you? The 50th Chicago International Film Festival concludes on October 23rd, 2014, with the Closing Night film, “Wild” Click here for information and to purchase tickets.